The two-day train journey from Singapore to Bangkok offers many delights including a variety of local - sometimes rather pungent - delicacies, as Christine Finn discovered. One of the biggest questions before a long train ride is about eating. By that I mean not only what food there will be, but whether there will be any at all. On long-distance trains in America, Japan, China and Siberia, I feasted on delicious finds en route, but journeys like these always start with a stock-up of unfamiliar snacks at the station kiosks. 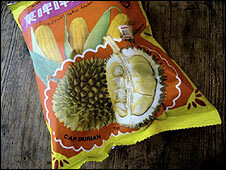 In Singapore's art deco terminal, bound for Bangkok, I spied something unusual: durian-flavoured popcorn. Now, the durian is a fruit which provokes delight or utter disgust. Its pungency is legendary: a mixture of cheese, onions, sherry, rotting meat and drains. Author Anthony Burgess wrote that it was "like eating sweet raspberry blancmange in a lavatory". The celebrity chef Anthony Bourdain described it far worse: "Like French-kissing your dead grandmother." Oddly, he is still a huge fan. So potent is the aroma from its large, fleshy lobes that the green, spiny fruit is banned from hotels, hospitals, planes and most other public transport, trains included. Novices, like me, start the relationship cautiously. I first sampled it as an ice-cream flavouring. So how could I resist durian popcorn? I bought one of the luridly coloured packets, tucked it into my bag and started my two-day journey. 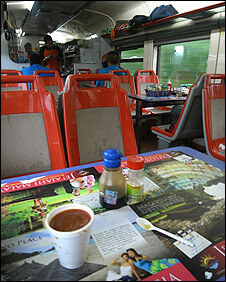 Sitting in the dining car with mugs of teak-coloured tea and fresh papaya, time flew by in a jungle tunnel. The first part of my trip to Bangkok began on the jungle train, which burrows through the heart of Malaysia to the east coast. Rail aficionados love the west-coast route from Singapore via Butterworth and Kuala Lumpur, a journey through British colonial history. But I fancied fewer rubber plantations and more mystery. I clambered into my second-class sleeper. It was comfortable but the upper berth was a little cramped for a picnic of snacks, so I went in search of spicy rice in the dining car. Back in my bunk, night fell quickly and the train powered into the dark, as Rudyard Kipling's jungle tales worked on my imagination. The dawn barely broke through the dense vegetation. We reached the end of my first line at Wakaf Bharu, and the durian popcorn was still intact in my rucksack. Off the train and to the border by taxi. I crossed into Thailand on foot. At Sunghai Kolok station, I bought a ticket for the afternoon train to Bangkok. It was a long wait, I was hungry and the durian popcorn was burning a hole in my bag. But the prospect of something freshly cooked was suddenly more compelling. I walked into town and feasted on Thai green curry, watching the world go by. Back on board, I had joyfully snagged a lower bunk in second class. "Dinner?" A young Thai man with a long ponytail and eyes made up like a peacock's tail came to my seat with a menu. It was one of my most enjoyable train meals ever, memorable also because this time armed guards were patrolling past my plate. The previous month a train had been targeted by terrorists. But my tensest moment was a light one: a soldier got his rifle trapped in my compartment door and we shared a nervous smile. Later an attendant - with a magician's flourish - conjured my seat into a single bed, with fine white cotton sheets and a thick white throw as seen at boutique hotels. I smiled "goodnight" to the woman across the compartment, drew the curtain and slept better than I have in many a stationary bed. 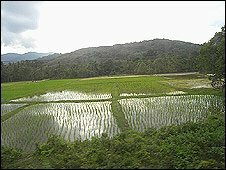 Dawn broke on villages, paddy fields and limestone crags. Children were walking to school, motorbikes coursing across the landscape. Soon we were cruising up the east coast of Thailand, in sight of the sea. We were running two, maybe three, hours late. My fellow travellers were getting tetchy and I was getting hungry. I searched for the durian popcorn. But I wondered whether I should risk unleashing this incendiary flavour. As I deliberated, the train stopped at a station full of hawkers bringing food onboard. "Try!" said a fellow passenger pushing a bowl of fishy porridge into my hands. Glutinous rice, shrimps and spicy green vegetables. Delicious. I arrived at Bangkok station still reclining on my white-draped sofa-bed. I had promised myself a Thai beer and the noodle classic, pad Thai, before heading for my plane. Three weeks later, back in England, the durian popcorn is still unopened. I gave it to a friend and it has pride of place on his mantelpiece. He loves the lurid illustration on the packet and is waiting for an occasion to open it. But he has never heard of durian. So, how much should I tell him?